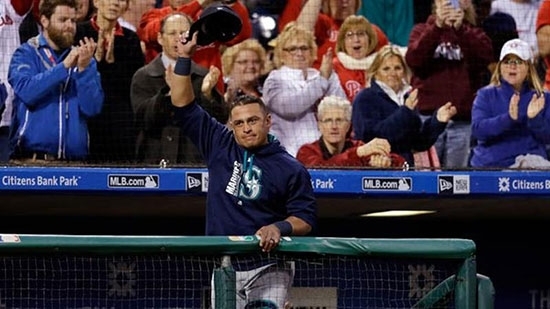 Former Philadelphia Phillies catcher Carlos Ruiz returned to Citizens Bank Park on Tuesday night, now a member of the Seattle Mariners. Ruiz played parts of 11 seasons in Philadelphia, including the 2008 World Series Championship. He was signed at age 16 out of Panama and spent 18 years in the organization. It was a special moment for him and the fans. He received a standing ovation in the middle of the 3rd inning when he was acknowledged on Phanavivsion and graciously tipped his hat to the crowd. Cheers of "Chooch!" filled the stadium when Carlos pinch hit in the top of the 8th inning. He popped up. He is expected to start the game tonight. "I definitely would like to come back to this organization. I don't know when," Ruiz said. "I know before I left they came to me and told me the door is open for me any time I want to come to Philly and work with this organization. That's big. That is something I think about right now. This year I want to finish strong and we'll see what happens when I'm not playing baseball." Philadelphia Police are asking the public's help in identifying two vandalism suspects. It took place on April 23rd inside the Vietnam Veteran's Memorial located at Front and Spruce streets in Society Hill. An unknown white male and an unknown white female were caught on surveillance video. The man can be seen placing a stencil (disguised as a pizza box) on the ground and spray painting while the female kept lookout. They painted in several different locations before fleeing in an unknown direction. Police say that the message was for a band's upcoming album release but have not released anymore information lest give them publicity. The man is described as a white male, 25-30 years-of-age, wearing a black hat, black shirt, and blue jeans. The woman is described as a white female, 25-30 years-of-age, blonde hair, stocky build, wearing a gray shirt, and black pants. If you have any information or recognize either suspect call police at 215.686.TIPS (8477). You can see the surveillance video below. Police in Cinnaminson, NJ are searching for a suspect who was caught on video throwing a rock through the front door of a church over the weekend. It happened around 3 a.m. on Sunday May 7th at St. Charles Church located at 2500 Branch Pike. The man can be seen throwing objects several times at the church. He had a beard and long hair in a bun. Also on May 7th, a brick was thrown through a window of the New Apostolic Church and damaged a pew inside. Police do not know if the two incidents are related. Anyone with any information is asked to call Cinnaminson Police at 856-829-6667 x 2061.